Following months of robust gains, U.S. employers tempered hiring in March. The modest pace of job creation, though, is consistent with slower economic growth in the first quarter that partly reflects a strong U.S. dollar, harsh winter weather and the shutdown of West Coast ports. 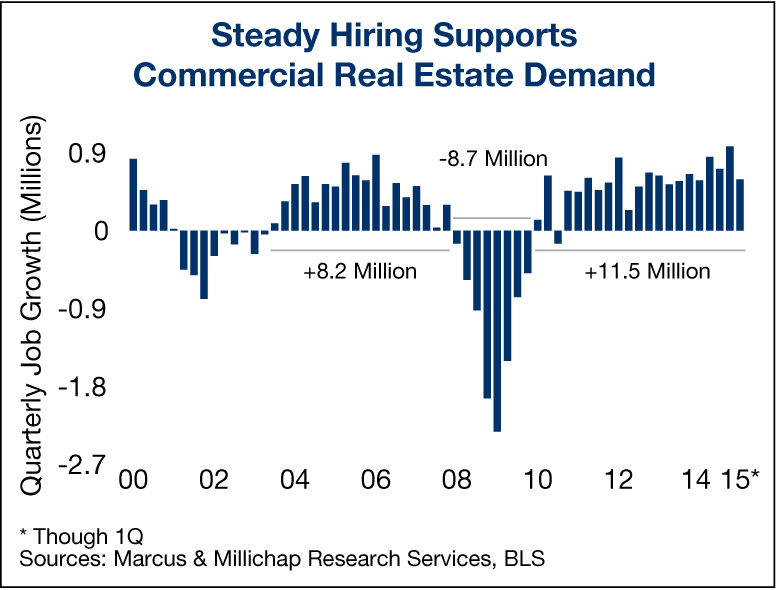 Other economic trends, however, indicate that the slowdown in hiring will be only a temporary setback and the economy will regain momentum over the remainder of 2015. Last month’s hiring will also ease pressure on the Federal Reserve to raise its benchmark lending rate in the immediate term. U.S. employers created 126,000 jobs last month, entirely in the private sector. A slower pace of expansion, and not widespread layoffs, accounted for the moderation in hiring. Bars and restaurants, for example, after adding nearly 66,000 in February, throttled back to just 8,700 workers last month. New bar and restaurant openings appear to be leveling off after climbing over the past four years, indicating potentially slower growth in the months ahead. Retailers continued to add to staffing last month following February’s 4.5 percent gain in core retail sales, though retailers’ pace of hiring moderated to 25,900 positions in March. Three sectors shed workers last month, led by a loss of 11,000 positions in natural resources and mining related to the idling of oil and gas rigs. Manufacturers and builders also trimmed payrolls nominally. Although hiring slackened last month, more than 3.1 million jobs were created over the past year and average hourly earnings also increased. Inflation-adjusted disposable income, a broader measure of purchasing power, is also up 3 percent from one year ago, providing a substantial lift to households that will translate to greater spending and near-term economic growth. Recent indicators of growing consumer confidence include a rise in pending sales of single-family homes. Sales of single-family homes often lead to greater spending as homeowners purchase new furniture and appliances. Consumers also continue to buy other long-lasting goods in greater numbers. Additional trips to the mall and shopping centers by consumers will continue to support a strong retail property market and contribute to steady hiring in retail trade. U.S. retail vacancy was 6.6 percent at the end of 2014 and new store openings will trim the rate further this year, to 6.0 percent, behind net absorption of nearly 88 million square feet. Completions will total only 47 million square feet, but additional multi-tenant space may be required after 2015 to accommodate the expansion plans of national chains and other in-line retailers. Professional and business services employment also continues to grow, with employers adding 40,000 workers last month. All told, primary office-using employment sectors including professional and business services added 871,000 positions over the past year, contributing to an increase in occupied space in the U.S. office sector. Minimal construction will divert additional rises in space demand to existing properties this year, underpinning net absorption of 107 million square feet and slicing vacancy 80 basis points to 14.5 percent. This entry was written by marcusmillichap, posted on April 6, 2015 at 10:31 pm, filed under Uncategorized. Bookmark the permalink. Follow any comments here with the RSS feed for this post. Post a comment or leave a trackback: Trackback URL.